At least 15 Mohawk protesters seized and occupied a building owned by Six Nations band council Wednesday, vowing to stay until their demands are met. About six workers were in the district office for Indian and Northern Affairs Canada at 188 Mohawk St. when the Mohawks arrived just after 8 a.m.
"No one was hurt and there was no violence," said Audrey Doerr, a regional director general for Indian Affairs. No weapons were seen. The Mohawks cited a number of reasons from unresolved land claims to the native standoff at Gustafsen Lake, B.C. for the occupation. Band council leases the district office space to the federal government. About 40 per cent of the 55 workers employed there are native people who live in the Six Nations community, Doerr said. But in a press release, the Mohawks said the Crown had "illegally assumed jurisdiction over Mohawk property." In an interview, spokesman Richard Hill said other native people should rally around the group's causes. 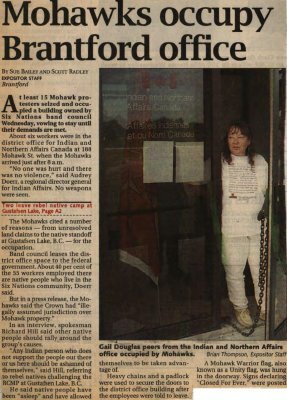 "Any Indian person who does not support the people out there or us here should be ashamed of themselves," said Hill, referring to rebel natives challenging the RCMP at Gustafsen Lake, B.C. He said native people have been "asleep" and have allowed themselves to be taken advantage of. Heavy chains and a padlock were used to secure the doors to the district office building after the employees were told to leave. A Mohawk Warrior flag, also known as a Unity flag, was hung in the doorway. Signs declaring "Closed For Ever," were posted. Doerr, Audrey ; Hill, Richard ; Douglas, Gail. Six Nations Elected Band Council ; Indian and Northern Affairs Canada ; Royal Canadian Mounted Police.